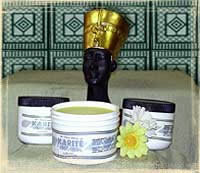 Karite healing salve is Shea nut butter blended with herb infused sweet almond oil. 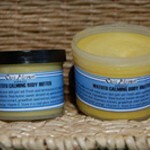 Karite healing salve is a unique formulation and a wonderful addition to your every day medicine chest, effective for young and old. Tagged as aromatic, baby, burns, combination skin, dandruff, dry skin, eczema, hair, hypoallergenic, scalp, scrapes, seborrhea, skin. Unfortunately the orthodox approach to treating skin ailments often overlooks the internal orgin of the problem; concentrating instead of treating the skin locally as if it a were separate entity. Skin problems are often a manifestation of an internal systemic condition. A group of herbs call alteratives gradually restore proper functioning of the body, increasing health and vitality. In addition to these alteratives, Karite Herbal is suffused with essential oils of lavender, chamomile, tea tree, lemon grass, rosemary and cedarwood; these are antiseptic, anti-inflammatory, fungicidal and parasitical in nature. Karite healing salve is a unique formulation and a wonderful addition to your every day medicine chest, effective for young and old.